Today, the CSB released a “Business Case for Safety,” summarizing four major accident investigations from the last 15 years and detailing why safety is good for business and ultimately a company’s bottom line. Included in the business case are the costs associated with the 2005 explosion and fire at BP Texas City, the 2010 explosion and fire aboard the Macondo/Deepwater Horizon oil rig, the 2012 explosion and fire at the Chevron Refinery, and the 2013 fire and massive explosion at West Fertilizer. Each of the four CSB accident investigation details both human and financial tolls which these incidents had on the company and the surrounding communities. 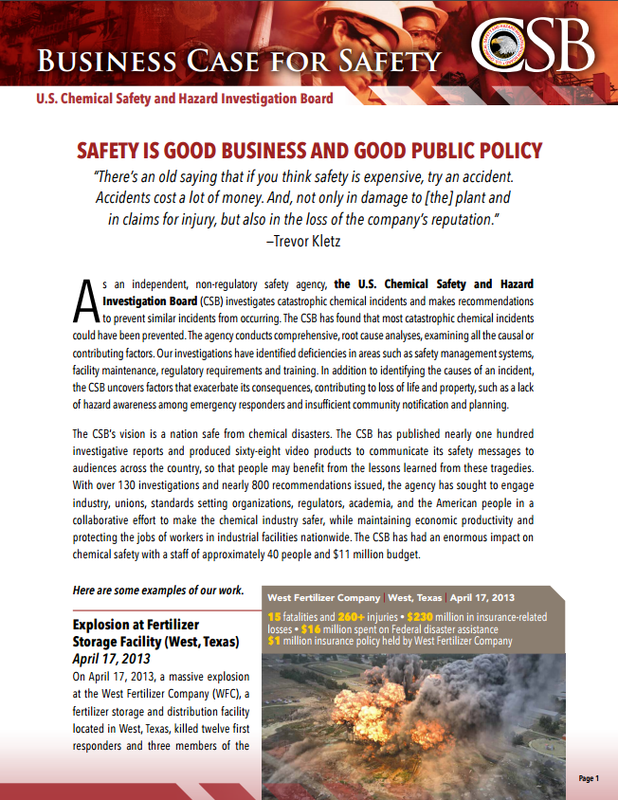 The CSB’s “Business Case for Safety” emphasizes that based on its more than 130 incidents it is clear that hundreds of billions of dollars have been spent as a result of chemical disasters in the United States. To ensure the safety of all Americans it is critical that chemical safety lesson are learned and shared among diverse stakeholders and across industries to prevent accidents. The CSB concludes that strong safety programs are critical for the economic success of the chemical and petrochemical industries. The CSB’s continued collaboration with industry, regulators, standards setting bodies and other professional organizations proves that the CSB has a vital role in driving critical chemical safety change in the United States.